The Power Mac G5 line included the most powerful PowerPC-based computer Apple ever sold, also making it a powerful line for Classic Mode – especially the last generation dual- and quad-core models, as Classic then has unfettered access to one of the Power Mac’s cores. There were the first Power Macs with built-in USB 2.0 and the first to use SATA. Prior to the last generation, Apple used the same PCI slots found in previous Power Macs in the entry-level model and the newer, faster PCI-X slot in the two faster versions of each generation; both PCI and PCI-X lines used 8x AGP for video cards. With the final generation, Apple moved to dual-core CPUs and PCIe, the same expansion bus found in Mac Pros prior to the 2013 model. Although all G5 Power Macs use 150 Mbps SATA for their hard drives, they use the older Ultra ATA/100 for their optical drives. When running OS X 10.5 Leopard with Personal File Sharing enabled, you can use a Power Mac for Time Machine backups on your network. Bear in mind that Apple’s partion mapping system can only support drives with up to 2 TB capacity – about half as much as today’s biggest hard drives. Still, SATA drives are inexpensive, so a Power Mac G5 can make an inexpensive Time Machine backup server. Leopard (the first version of OS X with no support for Classic Mode) is supported on all G5 Macs. Unfortunately, reliability has been all over the board, with up to one-third of some versions requiring service in the first few years of use. 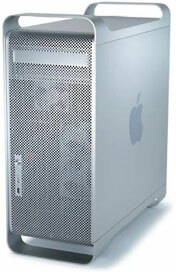 Reliability ratings are based on statistics compiled by MacInTouch in June 2006, at which time the dual-core Power Mac G5 models had only been on the market for 8 months. Letter grades are based on failure rate: A = 0-7%, B = 8-14%, C = 15-22%, D = 23-29%, and F = 30% or higher. We also note the components that failed most often. In each generation, except for the final dual-core one, the fastest model is the least reliable, while the second-fastest is the most reliable, with the 2.3 GHz dual G5 from April 2005 being the most reliable of the bunch (the Late 2005 models were also just 8 months old when MacInTouch did its survey). Logic boards are the most expensive component to repair, followed by the power supply. Hard drives, optical drives, video cards, and RAM can be replaced inexpensively using third-party components. All that said, by this time these problems have probably been resolved, so if the Power Mac G5 you’re buying works, it’s likely to work well for years. The Power Mac line was displaced by the Intel-based Mac Pro, which has evolved from using two or four dual-core CPUs in 2006 to using one or two 4-core or 6-core CPUs today. Even the “consumer” Core 2 Duo iMacs from 2006 outperform G5 Power Macs in terms of overall processing power, and today’s Macs are far more powerful. You lose expandability and Classic mode when you go Intel (try SheepShaver to replace Classic Mode) while gaining an all-in-one solution and Intel power. Used G5 Power Macs range from 1.6 GHz single processor to 2.5 GHz quad processor models. For our take on the value of last generation G5 Power Macs, see The October 2005 Power Mac G5 Value Equation. Also see What’s the Better Value at the Same Price, a 2.7 GHz Dual CPU or 2.3 GHz Dual Core? Used Macs typically include a 90 day warranty. Memory and drive size reported as RAM/hard drive size. All Power Mac G5 models normally ship with a SuperDrive, although 1.6 GHz G5s configured with Combo drives are not uncommon (listed models have SuperDrive unless otherwise noted). Note that RAM for the dual-core models is about 40% cheaper than for earlier G5 Power Macs. Models are sorted by CPU speed, with the exception of the 2.5 GHz Quad. Prices may be limited to quantity on hand. Not responsible for typos. We try to factor in shipping costs and configuration when selecting the best values. Your best value depends on whether you need or want extra RAM, a larger hard drive, a better video card, etc. AGP video cards are listed in our Best Power Mac G4 and AGP Video Card Deals. Modules should be installed in matched pairs. There should be no surcharge for credit card purchases, and shipping is often (but not always) included. Vendors are listed in alphabetical order. Be sure to visit their sites for full details. For a quick overview of the 14 different Power Mac G5 models, see our Power Mac G5 Guide. 1.6 single, 1.8 & 2.0 dual (2003): GeForce FX5200 or Radeon 9600 Pro graphics, Combo or 4x SD. 1.6 GHz model has PCI slots, 4 GB max memory (vs. PCI-X, 8 GB in faster models), OS X 10.2 through 10.5. 1.8, 2.0, & 2.5 dual (2004): GeForce FX5200 Ultra or Radeon 9600 XT graphics, 8x SD. 1.8 GHz model has PCI slots, 4 GB max memory (vs. PCI-X, 8 GB in faster models), OS X 10.3 through 10.5. 1.8 single (2004): GeForce FX5200 Ultra graphics. PCI expansions slots. 4 GB maximum RAM. 600 MHz system bus – one-third of CPU speed vs. memory running at half CPU speed in all other G5 Power Macs, OS X 10.4 through 10.5. 2.0, 2.3, & 2.7 dual (2005): Radeon 9600 or 9650 graphics, dual-layer 16x SD. Radeon 9600 standard on 2.0 and 2.3 GHz models, 9650 on 2.7 GHz. 2.0 GHz model has PCI slots, 4 GB memory ceiling (vs. PCI-X, 8 GB in faster models), OS X 10.4 through 10.5. 2.0, 2.3, & 2.5 Dual, 2.5 Quad: Dual-core processors, PCI Express (PCIe) expansion slots, dual-layer 16x SD, Nvidia GeForce 6600 graphics, up to 16 GB of DDR2 memory. The Quad has a pair of dual-core CPUs and is the most powerful PowerPC Mac ever built, OS X 10.4 through 10.5. All models include a SuperDrive unless otherwise indicated. OS X 10.5 Leopard installed. Shipping may add $65 or more. No additional details such as slot type (PCI vs. PCI-X). Shipping may add $35 or more. Mac in the Box uses PayPal exclusively for payments. OS X 10.5 Leopard installed. Keyboard and mouse not included, $15 additional. Ground shipping averages $50. Mac of All Trades has the highest product turnover of any used Mac dealer we track. 30 day warranty. Keyboard and mouse not included. Ground shipping may add $43 or more. Shipping included. Operator Headgap thoroughly refurbishes and tests every Mac they sell. When buying, please let them know you heard about them on Low End Mac when entering your shipping information. Thanks! Shipping may add $39.50 or more. Keyboard and mouse extra. The last generation of G5 Power Macs, the dual-core ones, were the only PowerPC Macs to use PCI Express (PCIe). Because of this, compatible video cards are relatively rare. Shipping adds $12.50. Applemacanix also sells flashed PCI Express video cards. Don’t need G5 power? Check out our Best Power Mac G4 Deals and Best Mac mini Deals. Don’t need all the expansion or can’t afford a G5 plus a display? Consider the iMac G5.